Posted by Onely in Great Onelies in History, Profiles. We’re happy to announce a new series: Great Onelies in History, which we’re sure all you history buffs will enjoy. In this series, we’ll feature people who made a difference in the world and just happened to be single while doing it! 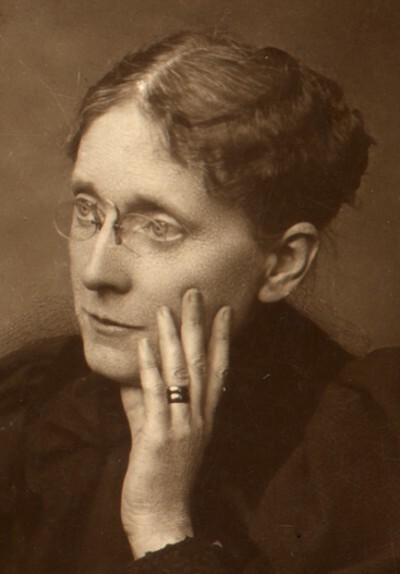 Frances Willard, Great Oneler in History! Willard was engaged briefly to Rev. Charles Fowler (1861) but broke off the engagement a year later. After traveling abroad with a good friend for two years (1868-1870), she decided to commit herself to work that would enable her to advocate for women – instead of getting married. When her former fiancee (who she had dumped a decade earlier) became the new president of Northwestern and refused to support her ambitions for women’s education, she resigned. Because she didn’t want to leave Evanston due to her family and friends, she turned down other offers to work in higher education; instead, she dedicated herself to public service on behalf of women at the local level and was soon elected president of the Chicago chapter of the WCTU (1874). Although “temperance” sounds outdated, the WCTU was a particurlarly important avenue for women who would not otherwise have been able to speak publicly or establish political connections with other women in the U.S.
Willard framed her arguments against the sale of liquor not on wholly moral grounds (which is how we contemporary folk like to think about prohibition), but on the premise that men’s alcohol abuse hurt women and children: At the time, married women could not vote or own property, so they did not hold political power – thus, when their husbands drank, women and children more frequently suffered from physical abuse and lack of money. Willard became president of the national WCTU in 1879, at age 40, and held the position for 19 years. Under her leadership, the WCTU became the largest women’s movement in the United States. While president, Willard encouraged local women to take charge of their own chapters – thus, the WCTU empowered women to speak and learn how to conduct political business – opportunities that “everyday” women would not have otherwise had. Willard fought for women’s rights to vote and to own property, better working conditions for women, better education for children (including free kindergarten and day-care programs), and in favor of labor unionism. Now, go tell your friends about this Great Oneler in History! 🙂 Any suggestions for more figures we should feature, friends? Please let us know! Glad you like Frances Willard. I am a retired Deputy Sheriff. I signed the YTC (teen group of the WCTU) at age 12. I have been married for 31 years. My husband and I have 5 children. I have continued my work with the WCTU. I am Maryland State President and National Media. Check out our World WCTU President, Sarah F. Ward. She is also single! What a great idea for a series. I never would have thought of that!